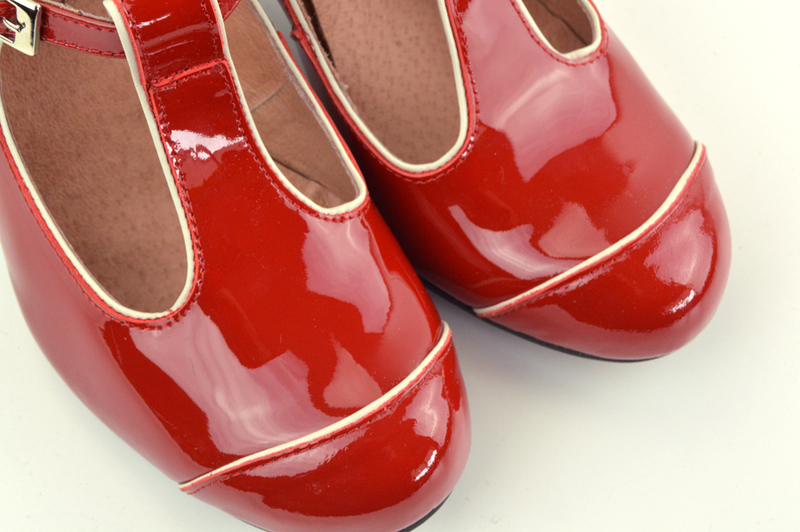 These stylish shoes have a real retro feel and we absolutely love them ! Called “The Dusty” after 60’s icon Dusty Springfield, we feel that these gorgeous shoes will suit those looking for the elegance of 40’s, 50’s and 60’s styling. They look amazing with a dress, but work equally well with jeans or casuals. The Dusty really is the “go to” shoe for any occasion. If you are looking for a shoe that combines elegance with all day comfort, then the Dusty is the one for you. The heel height is 3 inches, but because of the sturdy block shape, you just don’t feel that “wobble” that makes a more spindly high heel a scary prospect ! You will see from the numerous fab reviews how much our customers love their Dustys. In fact they can prove addictive, many customers come back again and again for more colours to add to their collection. As far as sizing is concerned, the Dusty is fairly true to normal UK size. If you are between sizes, then probably best to go down rather than up. Width-wise they are generous and should accommodate most widths of feet. 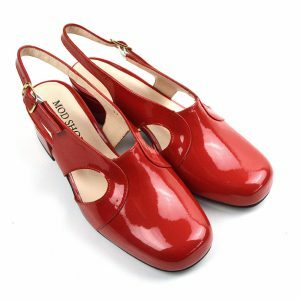 The red patent leather, has such a classic look about it and is sure to give every outfit the “Wow” factor, that only red shoes can give. 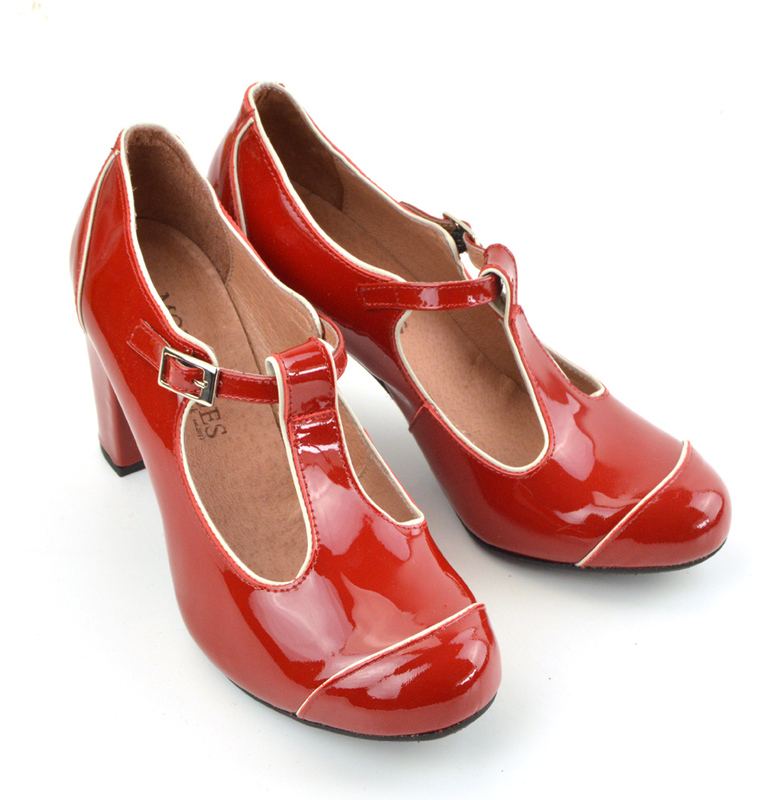 Note that we have given this new colour a twist by using a plain red heel. Take a look at the pictures below, and you can see just how unique and beautiful these shoes are. 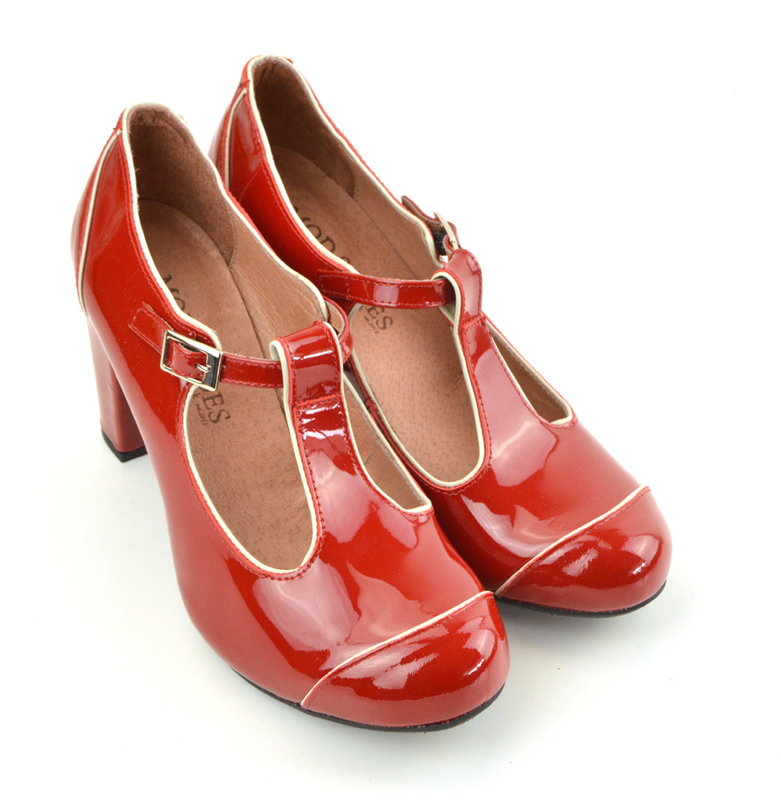 The shoes are made for us in Spain, by a small, exclusive company that specialise in small runs and retro style. 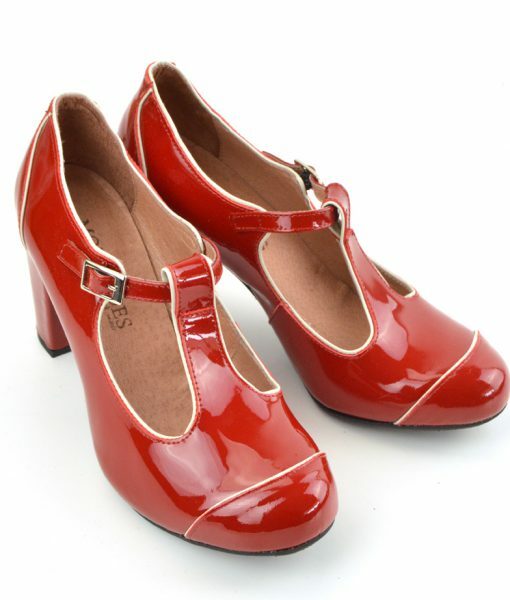 PLEASE NOTE THE RED SHOES IN THE VIDEO ARE PLAIN LEATHER NOT THE PATENT SHOWN ABOVE. WE THOUGHT YOU WOULD LIKE TO SEE THE VIDEO AS IT SHOWS THE SHAPE ETC. I liked these so much I bought them in two colours! I get so many compliments when I wear them. They are super comfortable as well as so stylish. I recommend sticking to the sizing that is suggested in the company description. Highly recommended. Thank you. My second pair of dustys! These are just so beautiful and so very comfy to wear. I absolutely love them! These are fabulous shoes! I have wide feet and could, at best, be described as curvy. I wore them to a wedding and considering I usually wear brogues or Converse, they we’re so comfy and easy to walk in. I think I’m in love! They’re true to size. 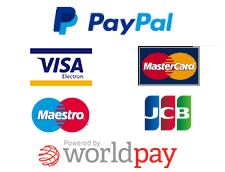 Why Buy from Mod Shoes? Exclusive footwear designed by us! "Smart Shoes For Smart People"
Creating your look from the floorboards up.